will tomorrow culminate in an election that will launch us into the 21st year of the nation’s democracy.However, there are some unhealthy developments in the election process that we should not allow to undermine the majesty of this thing called democracy, which has been generally rated above authoritarian rule. One of such ugly occurrences is violence instead of fanfare at political rallies. Political rallies by some of the different political parties ended up in disarray when thugs invaded the scene and unleashed violence on innocent citizens. The most recent was that of the All Progressives Congress (APC) in Abeokuta at which the first citizens of the country, President Muhammadu Buhari and the Vice President Yemi Osinbajo were present. Images of security men providing shield and cover for Mr. President, which were captured on video and which went viral, were scary and to say the least, disappointing. How and why should party stalwarts and their thugs throw stones at the president in a rally where ideas for the country’s development were supposed to be canvassed? A cursory examination of the incidents shows that the parties are yet to get their act together in terms of internal democracy. The culture of impunity, which politicians inherited from the military appears to have taken hold of their imagination. This is reflected in the selection of candidates for political posts. Some candidates have been imposed by godfathers, making it impossible for the rank and file of the party to have a real say in who gets what. At other times, external interests have been involved. Yet, as we have repeatedly stated, violence is not the answer. Violence and the use of brute force are antithetical to the principle and practice of democracy. Democracy is a contest of ideas. It is all about winning the hearts and minds of the people, the electorate who are indeed sovereign in the equation. Those who are aggrieved by party decisions are advised to go to court and seek redress. The first line, however, is to explore the internal mechanism within the party to correct a perceived infraction of the rules. Political rallies ought to be peaceful even if boisterous and celebratory. Different wings or branches of the same party come in with their music and entertainers, ostensibly to whip up confidence and cheer. At political rallies contestants and candidates are expected to present their programmes in order to convince the electorate. Both party faithful and others are allowed to attend rallies. Therefore, as we go to the polls tomorrow, let peace, justice, fairness and equity be our watchword. There must be no rigging. Leaders in all the parties should instruct their wards and stalwarts that the wish of the people as expressed through the ballot box must be respected. Both the international community and local groups are watching and monitoring the process. Let all parties respect the power and decision of a free and fair ballot box. The Independent Electoral Commission (INEC) and the security agencies must be above board and avoid creating room for despair and a resort to self-help. INEC must not only be independent, it must be seen to be independent. Policemen and soldiers should not yield themselves as agents to any of the contending forces. The people should be ready to guard their votes after voting. That way the true results will be respected and we would be sowing the seeds for a solid democratic tradition. In the same vein, presidential candidates who have signed a peace pact should respect that covenant with the people. Finally, the security agencies should be proactive in the days and weeks ahead. It should be possible to preempt outbreak of violence and nip it in its bud. Parties, youths and need for violence-free 2019 polls FEBRUARY 13, 2019 The 2019 election many have predicted will be a watershed in the political annals of the Nigerian nation and indeed book makers are already being proved right, especially with recent developments across political parties with regards to campaigns and all the accompanying violence at campaign grounds of the various political parties. Many bodies, both local and international have predicted that the election was going to be marred with violence of high proportion, though many people doubted it because similar predictions were made for the 2015 elections, but it went largely well without much negative result, even when an opposition political party for the first time in the nation’s history won election at the national level, making power to transit from the then ruling Peoples Democratic Party (PDP), to the opposition All Progressives Congress (APC). However, development especially within the APC from the time of the party primary has not had much to cheer about as most of its primaries were marred by varied kind of violence, and to some extent the violence and squabbles that greeted the party primary is still very much alive in many branches of the party. Even more worrisome is recent developments at various campaign rallies of political parties, again with particular reference to the APC, as many of its rallies have been marred by violence of various degree even with loss of lives in some instances. While we cannot deny the fact that crises and political rallies are like Siamese twins, especially in this part of the world, the question is must it be so? What is the benefit of crises in political rallies and who are the beneficiaries? If truth be told, many of those who engage in political violence are those who really have no serious stake in the contest, as politicians are in the habit of paying peanuts to political thugs to engage themselves in violence and if possible kill one another, while their children most of whom are abroad are shielded from the violence and being prepared to step into their shoes. We believe that there is no political ambition of anyone that is worth the blood of anybody and no one seeking political office is worth dying for. Everyone, especially the youths who are mostly the target to be used for violence needs to understand that they have a future ahead of them and with time and a little effort, they will step into their glorious future. But if you allow yourself to be used by political office seeker, you may never see that future that you desire. Note that the children of the politicians are not better than you. So, think first of yourself and know that your future and that of the nation is in your hands, don’t waste it. For many weeks, Nigeria was a gigantic theatre where politicians engaged in exhilarating drama, stimulating speeches, making sometimes plausible and sometimes outlandish promises, as they travelled by air, land and water from one part of Nigeria to another. 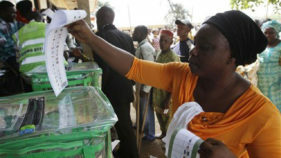 Since November 18, 2018 when the Independent National Electoral Commission [INEC] blew the whistle for the presidential and National Assembly election campaigns to begin, up till yesterday, February 14, 2019 when it formally ended, hopefuls in numerous political parties peddled their missions and programmes from cities to hamlets in a bid to win the hearts of 84 million registered voters. We implore all actors in this year’s election to desist from engaging in demeaning and criminal acts like vote trading. The outcome of some recent elections was tainted by vote buying, which cheapened the will of the people from being golden to the value of a loaf of bread. Electoral Officers and security personnel should be on the watch out for those who tempt voters with peanuts in order to steal their precious votes. Also, journalists should be protected against the barbaric acts of thugs and security men who consider the presence of journalists at polling stations and collation centres as threats to their evil manipulations. The free and unfettered participation of journalists and election observers, domestic and foreign, is a key to free and fair elections. We wish all the contestants good luck in tomorrow’s presidential and National Assembly elections but above all, we pray that the exercise strengthens rather than weaken our democracy.